It's Andrew and Doug with our first dispatch from Lhasa, Tibet. Our flight to Lhasa this morning was short and spectacular. We got great views and pictures of Everest, Lhotse and Makalu from our aircraft, and we briefly saw but could not photograph Kanchenjunga. 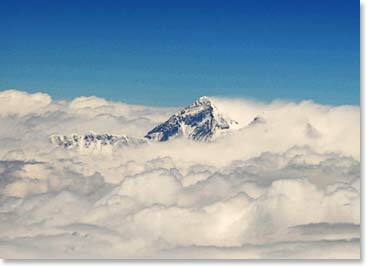 We also got great views and pictures of a massif to the west (possibly Annapurna). 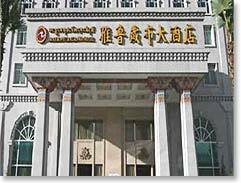 Immigration, customs and quarantine procedures in Lhasa were very smooth, and we soon met our guide, Tashi, and our driver, Lobsang. We rode in a white Toyota Land Cruiser the 65 kilometres to Lhasa, stopping to see an 11th Century Buddha statue on the way. 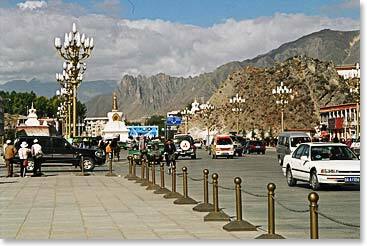 To our surprise, Lhasa is a very modern city, with new buildings everywhere. The boulevards are wide, and the traffic moves very slowly and orderly, at a maximum speed of 40km/h. 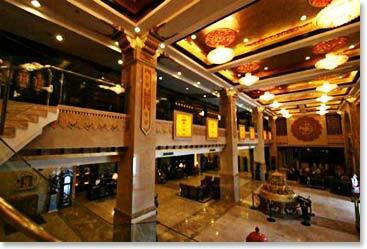 Our hotel, the Brahmaputra Grand Hotel, is one of the newest five-star hotels in Lhasa (and the best, according to Tashi). 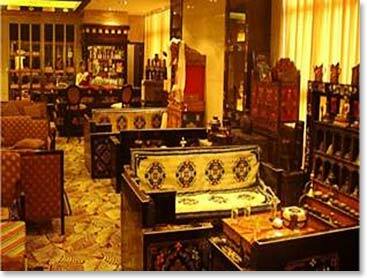 It is both a hotel and a museum, with a large number of Tibetan artifacts, many of which are very old. Most of the second floor is devoted to the museum, and the hallways on all floors contain display cases between the rooms. Our room is well appointed. In the evening, we had dinner in the Tibetan quarter of Lhasa, and then we went for a stroll around the area. 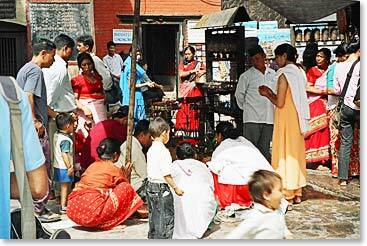 There are shops and stalls everywhere, and there is a much wider range of goods available than in Kathmandu.